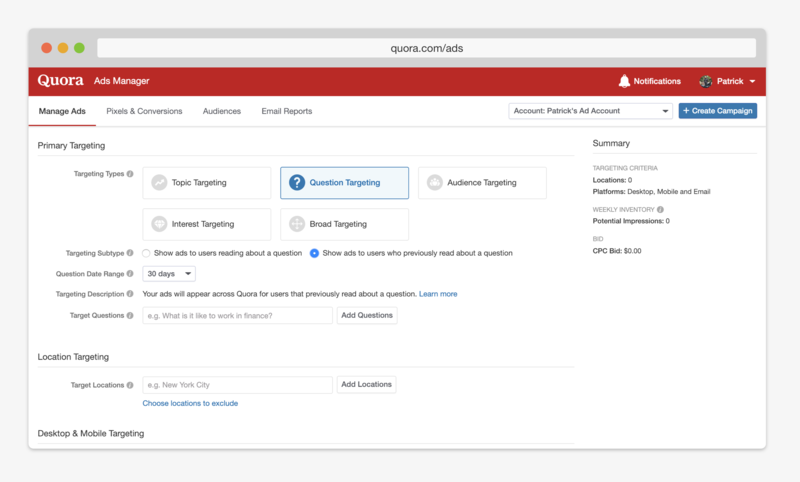 This week, Quora announced a new ad function that will allow advertisers to retarget users that have looked at specific questions. If you’re not already familiar with it, Quora is a question-and-answer hub which users visit to ask and leave answers to specific questions. We’ve discussed in the past why Quora is an underrated, but powerful brand awareness strategy for marketers. The new Question Retargeting feature makes it easier than ever for marketers to get right in front of users who have specific questions relating to their product or service. The logic behind this feature is simple: if someone is viewing several questions around video editing software, for example, they’re likely in the market to buy a video editing software. With Question Retargeting, you can now advertise directly to those users who are viewing questions related to your product or service. This is a new form of hyper-targeted ads that we haven’t seen deployed to this extent on other platforms. While many platforms have a wide variety of segmentation options, one thing that’s been harder to capture is intent. Even with highly developed buyer personas, it can be difficult to truly get inside the mind of the user in the buying process. This update provides marketers with new opportunities to get in front of users as they’re gathering information about a specific product or service. After selecting “Question Retargeting” as your targeting type, you can then choose between a variety of questions users have previously read to show ads on. You can also define a time range during which the ad will run, so you can be sure you’re reaching the user while they’re still expressing interest in the subject area. If a user matches the criteria, your ad will be shown on any Quora website page, not just on question pages. Additionally, Quora mentions how this feature pairs nicely with additional advertising features they offer. For example, if you know a user is looking at relevant questions, it might be helpful to promote an answer or host a session that pertains to that topic. If someone is searching answers that correlate with the top of your sales funnel, this approach will be more effective as it will lower the barrier to engaging with your brand and build trust with your audience. The digital ad landscape has experienced considerable disruption recently, with many platforms straying from standard display and video advertising options in an effort to create more personal, interactive ad formats that users will remember. The internet is flooded with advertisements, making it more difficult than ever to capture attention through digital ads. Developments like this are helping marketers get the most out of their ad spend, by allowing brands to connect with the most qualified prospects at the time their behavior send buying signals. If you’re not seeing success with standard paid media, try exploring some of these new Quora ad methods to get in front of the right people at the right time.